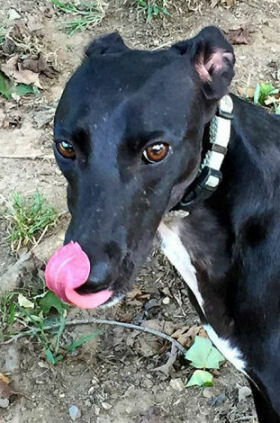 Is a Whippet Really the Perfect Pet? If you’ve taken one of those “find-a-breed” tests on the internet and asked for a quiet, gentle yet playful dog that requires little grooming and a moderate amount of exercise, chances are you came up with a whippet. If you’ve ever met any whippet owners, chances are they told you they’d never own another breed. It sort of makes you wonder why there would even be a need for whippet rescue, doesn’t it? No breed is perfect for everyone. Characteristics that endear a dog to one person are annoying to another. Behaviors that one owner finds mildly aggravating are intolerable to another. So what are some common problems whippet owners report? 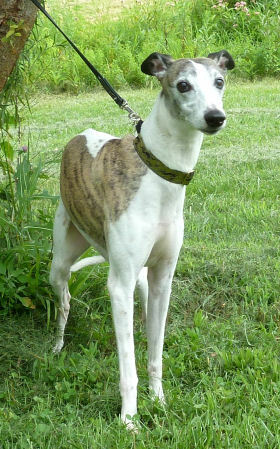 What misconceptions did they have before acquiring a whippet? Following is a comprehensive list of issues that come up regularly on whippet message boards and email lists. Many of these traits, like carsickness, are common to some dogs of any breed; others, like “counter-surfing” are specifically whippet characteristics. So keep in mind that while these things are not rare in whippets, they are by no means true of all whippets. Some of them can be addressed with training or behavior modification, but if any of them are habits or traits you just could not live with, be sure to find out if the specific dog you’re considering adopting has them! Many whippets have trouble with carsickness all their lives. While most grow out it after puppyhood, for some it can be a lifelong problem. An invisible fence will not contain a whippet. If a whippet sees something to chase on the other side of the fence, she’ll zip right through it and not even feel the sting till she’s across the street. An invisible fence also does not prevent other animals from entering your yard. A whippet is a relatively small, lightweight dog without a heavy, protective coat…she is no match for the Rottweiler or Doberman that has escaped its own fence and come looking for a fight. Often when people acquire short-haired dogs with dense coats, they do not expect them to shed. Whippets do shed, some of them quite a lot. Whippets are not hypoallergenic. People who are allergic to dogs have just as much trouble with whippets as with any other breed. Whippets sometimes do not do well as only pets. They are much happier with either canine or human company, and if left completely alone, some may be noisy, destructive and neurotic. Do not get a whippet if you don’t have much time to spend with your dog. Whippets get on the furniture. It is nearly impossible to teach them not to. If you have priceless antiques, don’t expect a whippet to respect their value. Whippets are known for their “counter-surfing” ability. These dogs are agile and cat-like in movement, and many seem to gravitate to the highest accessible place in the room…even if that’s the kitchen counter or the dining room table. Sometimes they “counter-surf” just to look out the window; other times they’re scouting for food, and if you’ve left the Sunday pot roast on the counter, it’s history. Whippets may kill cats and any other small animal that runs. 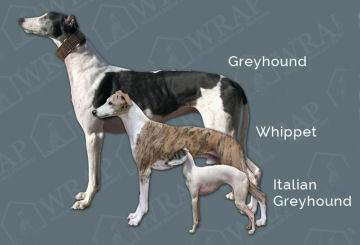 Prey drive is a powerful instinct and whippets were bred to chase and kill rabbits. Some dogs are prone to eating feces, either their own or that of other animals. This is a common complaint among many breeds, and whippets are not exempt. The only sure-fire cure is to keep your yard clean! A whippet is not 100% reliable off-lead. You must keep him in a fenced yard or leashed at all times. Again, prey drive is such a strong instinct that no matter how well-trained he is, a time may come when the desire to chase will outweigh his desire to obey you. Some whippets are claustrophobic and will never submit to crating. This is relatively rare (usually the dog is simply spoiled and knows if he’s noisy enough, you’ll let him out!). A few whippets will climb or jump fences. There are some of these climbers and jumpers in every breed, but they are difficult to house safely. If you have an escape artist, you may have to walk him on lead rather than turning him out in the yard. Although whippets are usually quiet and gentle enough for apartment living, they need regular exercise and must always be leashed or fenced. Before you decide on a whippet as an apartment dog, be sure you can commit to three or four walks a day, regardless of weather, as well as to taking your dog to an enclosed area (dog park, friend’s yard, etc) to run a few times a week.